A Rabbi (Jewish scholar and teacher) prayerfully reads from the Torah which, according to traditional orthodox Jewish thought, is the book of the law given by God to Moses on Mt. Sinai. The Torah includes the five books of Moses (Genesis, Exodus, Leviticus, Numbers and Deuteronomy). The word of Torah can also refer to the entire body of wisdom and law contained in Jewish Scripture. The message of the Torah is one of compassions, and is intended for all humankind, revealing the nature of God and his relationship to us. 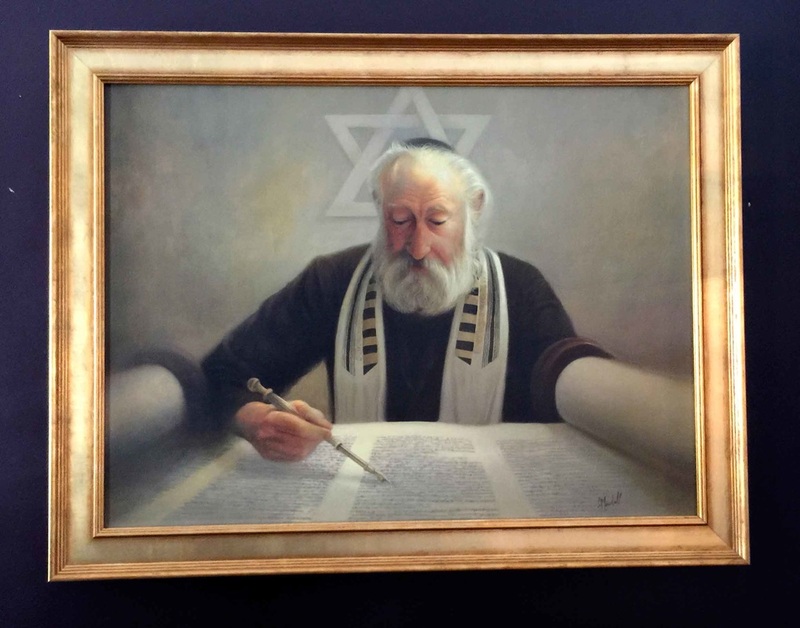 In this painting the Rabbi is wearing a tallit (prayer shawl) which is worn daily during morning prayers and services and special holidays. Note the yad (pointer) that he is holding as he reads. Yad is a Hebrew word for hand. This is to ensure that the fragile parchment is not touched, preserving it from damage.